A blog dedicated to odd, weird and strange animals (and occasionally other organisms) from all around the world and other animal-related stuff! The Coconut crab is a terrestrial hermit crab and the sole representative of the Birgus genus. It holds the record for world's largest land-living arthropod. It can be found on many islands across the Indian Ocean as well as parts of the Pacific Ocean. The coconut crab is the largest known land-living arthropod, with a length of up to 40 cm (16 in.) and a weight of up to 4.1 kg (9.0 pounds), with males usually being larger than females. Leg span can be 1 meter long. The carapace (the upper section of the exoskeleton) may reach a length of 78 mm (3.1 in), and a width of up to 20 cm (7.9 in). The body is segmented in two parts, the cephalothorax that has 10 legs and the abdomen. The front legs have large claws (called chelae) with the left leg being slightly larger that the right. The front legs are used for opening coconuts and lifting various items (of up to 29 kg!). The two next pairs of legs are strong, pointed and used for walking. With these legs they can also climb vertical and overhanging surfaces. The fourth pair is smaller and has tweezers like claws which are utilized by younglings to grab the interior of a shell or a coconut piece. They use these as a means of protection. Adults use the fourth pair only for walking and climbing. The fifth pair is very small. Males use it for mating and females to take care of their eggs. 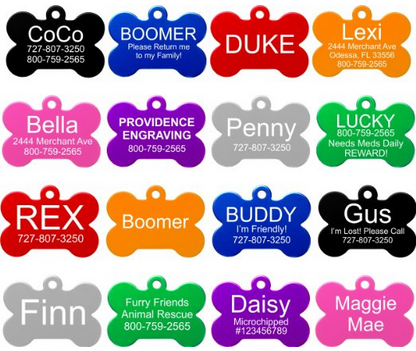 These strange animals come in a variety of colors which vary from orange to red and from purple-like to blue. In most areas, blue is the predominant color, however in some places like the Seychelles, red is the most dominant. 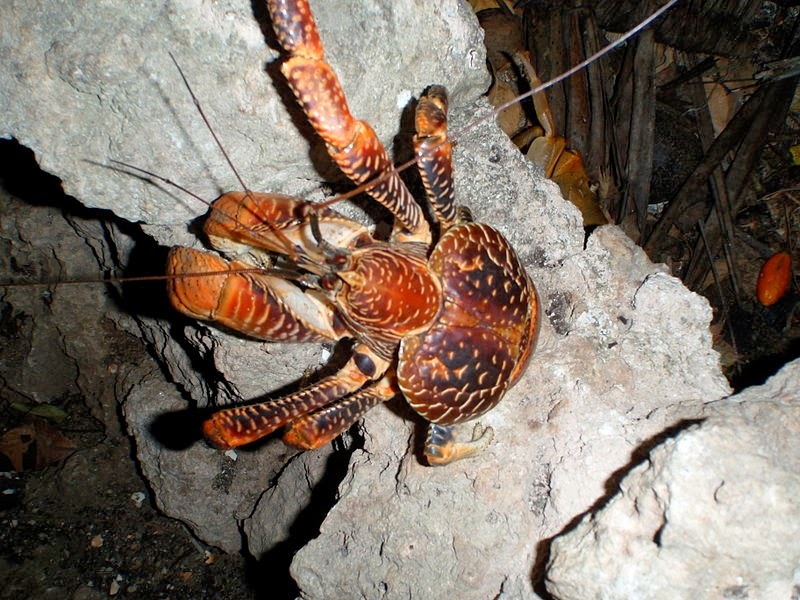 In general, hermit crabs scavenge shells or other things to use for protection, however coconut crabs do this only during their adolescence, when their abdomens are still soft. But once they mature, their abdomens harden with chitin and chalk, hence they have no need to carry a shell for protection. Their hardened shell also reduces water loss (dehydration) in the land. Adults moult once per year, digging a hole up to 1 m (3 ft 3 in) long, where they hide during this vulnerable phase. They stay in this hole for 3 to 16 weeks and after the molting process is complete they require an additional 1 to 3 weeks for the exoskeleton to harden. Coconut crabs can't swim (except during the larval stage), and will drown after about 1 hour if they somehow end up in water. They breathe using an organ called branchiostegal lung. This organ is essentially an evolutionary stage between gills and lungs, and is probably the most important adaptation that allows this animal to live on land. The branchiostegal lung contains a tissue similar to the one found in gills, but suited to absorb oxygen from air, instead of water. The organ is located in the cephalothorax. It is expanded laterally and evaginated to increase its surface area. It is optimally placed to reduce both the blood/gas diffusion distance and the return distance of oxygenated blood to the pericardium. Coconut crabs use their fifth smallest pair of legs to clean these breathing organs and to moisten them with water. The branchiostegal lung requires water to function properly, which is provided by stroking its wet legs over the spongy tissues nearby. Coconut crabs may drink water from small puddles by transferring it from their chelipeds to their maxillipeds. Video of a coconut crab grabing a stick with its pinchers. Strong grip! In addition to the branchiostegal lung, they also have a rudimentary set of gills. Although these gills are comparable in number to aquatic species from the families Paguridae and the Diogenidae, they are reduced in size and have comparatively less surface area. Sexual maturity is reached after about 5 years, and the total lifespan may well exceed the 60 years of age! Maximum size is reached at the age of 40 to 60 years old. They have also developed a very acute smell that they use to locate their food. Mating usually occurs during the beginning of June up to the end of August. During mating, males deposit their spermatophores in the female's abdomen. It is believed that fertilization takes place on the exterior surface of the abdomen while the female's eggs pass through the spermatophores. Female coconut crabs then lay their eggs in crevices or burrows near the sea, and glue them just below their abdomens. They will carry the fertilized eggs for a few months, and when they are about to hatch they go again near to the sea. The larvae then hatches and swims into the ocean. The now empty eggs remain glued and are eaten by females over the next few days. The newly hatched larvae will float into the ocean for 3-4 weeks, with many individuals being eaten during this period by predators. During the first 25-33 days of their lives, the larvae passes through 3 to 5 zoea stages, molting from stage to stage until they moult into the post-larval glaucothoe stage. Once this form is reached, they go to the sea bottom and settle there. There they will search for a gastropod shell that fits their size, "wear" it and relocate near the shore line, visiting the land every now and then. After a while, they lose their ability to breath underwater and thus move permanently to the shore. As they grow, they replace their shell again and again with a bigger one. If they can't find a proper "size", they will use broken coconut pieces or other items. Once their abdomen hardens they will ditch their old shell once and for all. As you can see, despite their common name, these weird animals eat all kinds of things, with coconuts being only a small part of their diet. Adult individuals have no known predators, except of other coconut crabs and humans. The species is hunted extensively for its meat. People in Southeast Asians and Pacific Islanders consider their meat a delicacy and an aphrodisiac. As a result, populations in certain islands have greatly declined or gone extinct. 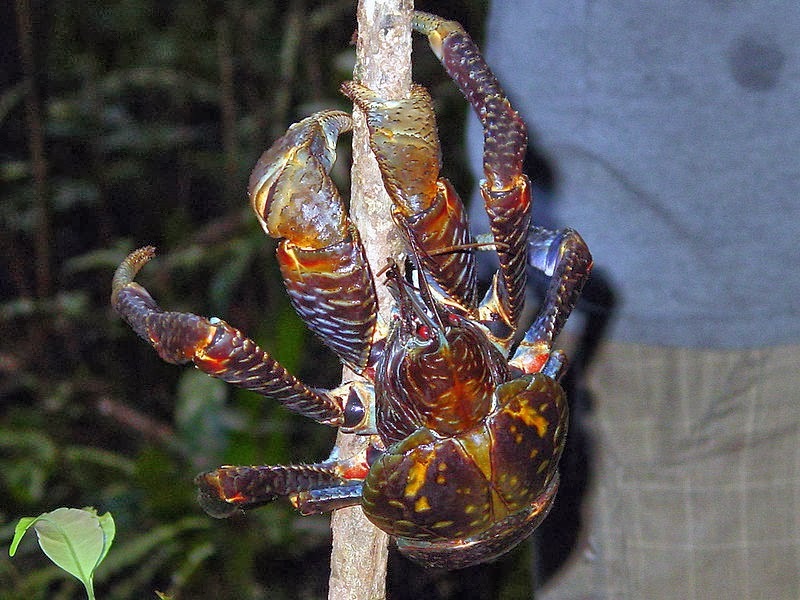 Is The Coconut Crab Threatened? 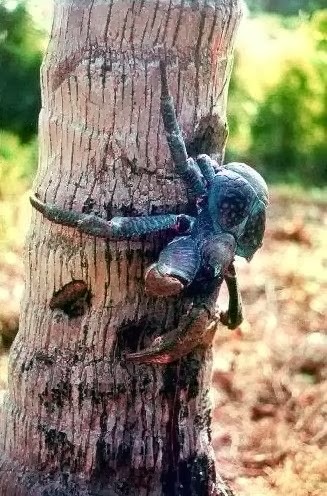 As aforementioned, many Coconut crab populations have greatly declined or even gone extinct due to either habitat loss and/or human predation. During 1981, these animals were listed by the IUCN as vulnerable, however, they got listed as Data Deficient in 1996 due to insufficient data. 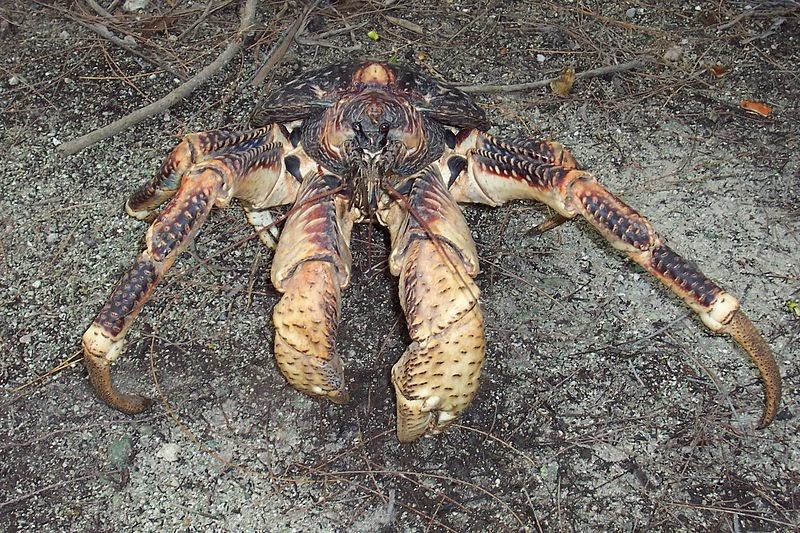 Eating and hunting coconut crabs is prohibited in the British Indian Ocean Territory, with very expensive fines of up to 3.000 USD per coconut crab killed or eaten. 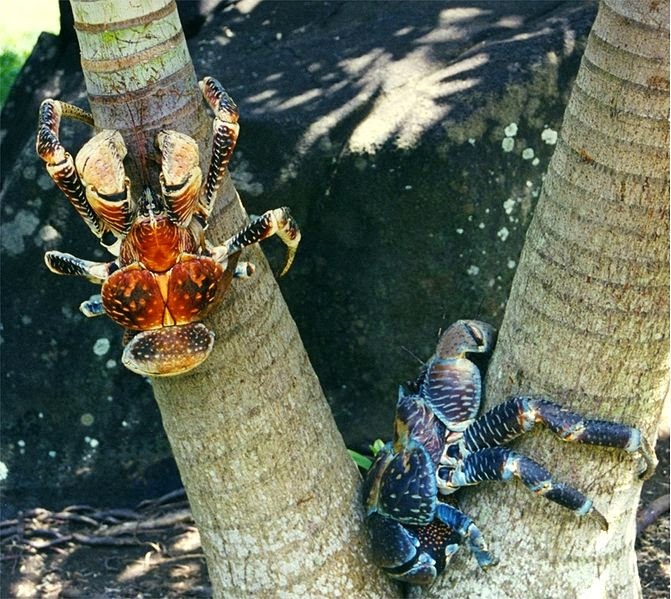 - The coconut crab can take a coconut from the ground, cut it to a husk nut, grab it with its claw, climb up a tree of up to 10 m high and drop it down to access the content inside. - Often, they won't climb down a tree the same way they climbed it up. Instead, they simply... jump! They can survive falls of at least 4.5 m with little to no damage. - They can cut holes into coconuts using their strong claws to eat the contents inside. However, it may take them several days before they manage to open a coconut. - Some believe that coconut crabs may be responsible for the disappearance of Amelia Earhart's (1897 - 1937) remains, an American aviation pioneer and author that disappeared after an attempt to make a circumnavigational flight of the globe in 1937. Coconut crabs may have consumed her corpse. Buy a Coconut Crab today! The owner of this website, http://www.strangeanimals.info, is a participant in the Amazon Services LLC Associates Program, an affiliate advertising program designed to provide a means for sites to earn advertising fees by advertising and linking http://www.strangeanimals.info to Amazon properties including, but not limited to, amazon.com, endless.com, myhabit.com, smallparts.com, or amazonwireless.com. Strange Animals. Simple theme. Theme images by Jason Morrow. Powered by Blogger.